Kenyan military said in a statement that Al Shabaab’s intelligence head, Mahad Mohammed Karatey has been killed in an airstrike in Somalia. Karatey had gone to the camp to preside over the passing out of an estimated 80 Alamnyat recruits who had completed their training and were due for deployment, said Kenya Defense Forces Spokesman Colonel David Obonyo. The US government had placed a $5 million bounty on the head of Karatey. 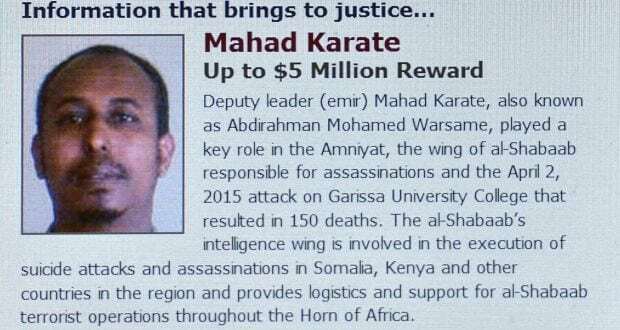 Karatey, was killed along with 10 midlevel Al-Shabaab commanders and 42 recruits. His killing will be a major blow to the Al Shabaab terrorist group. Kenyan authorities believe karately was involved in the attack against Kenyan troops in El-Adde, Somalia and the attack on Garissa University in Kenya last year.